Finally, the Heavy can properly express his love for the Medic. It made sense when Valve Software starting adding additional guns to Team Fortress 2. It's a first-person shooter, so more guns means more fun, right? It made less sense when Valve unveiled an entire line of hats for the game, but y'know, these guys made Portal and Half-Life, so who are we to question their creative genius? Now they've added a wedding ring to the game. Sorry, but I don't know how to rationalize this one. 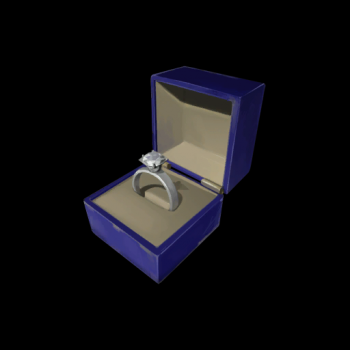 The ring, which is formally known as "Something Special For Someone Special" was secretly added to the game's crafting system in the most recent TF2 update. Though missing from the official patch notes, players quickly found the item in the game's code and added it to the fan-generated Team Fortress 2 Wiki. Unsurprisingly, the Wiki doesn't even attempt to explain the ring's purpose. We here at The Escapist are a news outlet, first and foremost, and we take that role very seriously. While others might content themselves with merely reporting the facts of the situation, those "facts" leave so many questions to be answered, so it is our duty as purveyors of truth to offer some form of explanation for this ring's existence. However, that seems like a lot of work, and to be honest we're drunk on the holiday spirit (also, egg nog). Thus, I throw it to you, dear readers. Why do you think Valve added a wedding ring to Team Fortress 2?